I’m too tired to decorate properly cake. My eldest daughter volunteered my services to make some chocolate cupcakes for her class party. Her teacher had said it was a wonderful idea. Shame she didn’t tell me… well she did give me a couple of days notice. After all her and her teacher had discussed this 2 weeks prior. This was all going fine, up until I had to take some medication. This little tablet made making cupcakes one of the hardest jobs I’ve ever done. I sat down making all the pure chocolate decorations in the afternoon, so by the time I had baked, cooled and piped a swirl on top, I knew that it wouldn’t take long to finish and head for an early night. I love my chocolate roses, I’ve definitely improved my technique since I first made them last year. Thinking about it, I’m glad I took photos, or I wouldn’t really remember these cake at all. I had enough cake batter left over that I made our house a little cake. With some brushed sugar syrup to keep it moist and oodles of chocolate buttercream to please my sweet tooth. I was so tired that I grabbed the biggest piping nozzle I had, and piped this cake in 3 minutes. I don’t even remember putting the gold balls on (so it was a nice surprise in the morning). The up side to the cupcakes was the class loved them, and one even said it was the best cupcake they had ever had. So I must have done something right that evening. The kids especially like the modelling chocolate decorations. Fortunately I don’t have to take this medication again, so no more sleepy baking sessions. I have a few things planned for October. 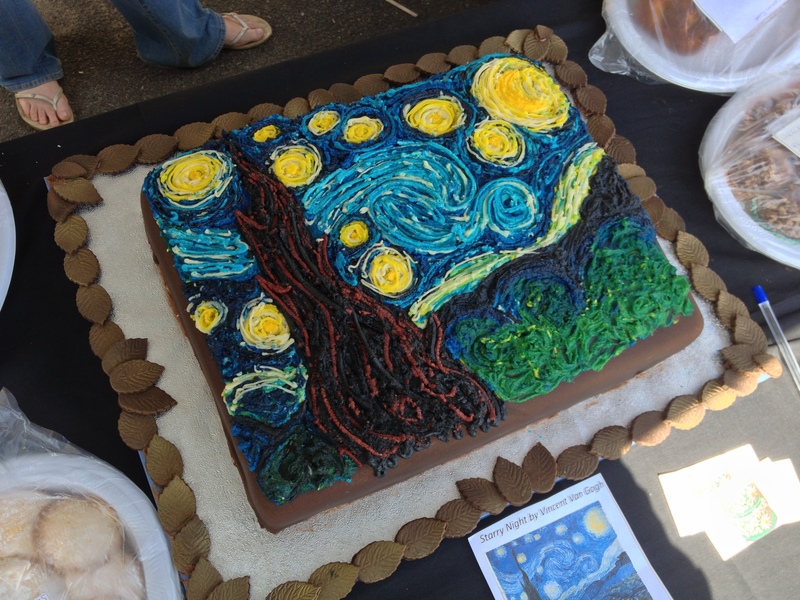 I am doing a 3 tier chocolate cake inspired by Van Gogh ‘Starry Night,’ for the school Arts Festival. The cake will either be a raffle or silent auction – must be strong and not bid on my own cake…or I won’t be able to fit into the wedding dress for next year. There is a few birthday cakes, and obviously Halloween. 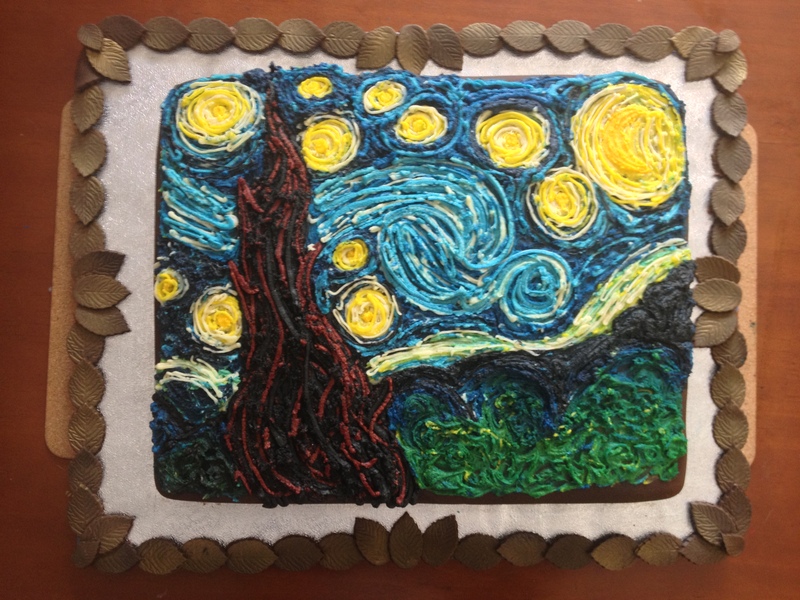 Which I must improve on my Jack O Lantern Cake from last year – in the gallery. I also want to make a Hansel & Gretel wicked witch house. Again, must remember my waist line! A friend of mine has also asked whether I’d be interesting in teaching some cake basics to some customers of hers. So there are plenty of things to keep me busy in the next few weeks. And not only baking,I have my knitting class to plan. Must design and knit a springtime shrug, write the pattern down. Easy peasy…. much easier than baking with a dose of drowsy. 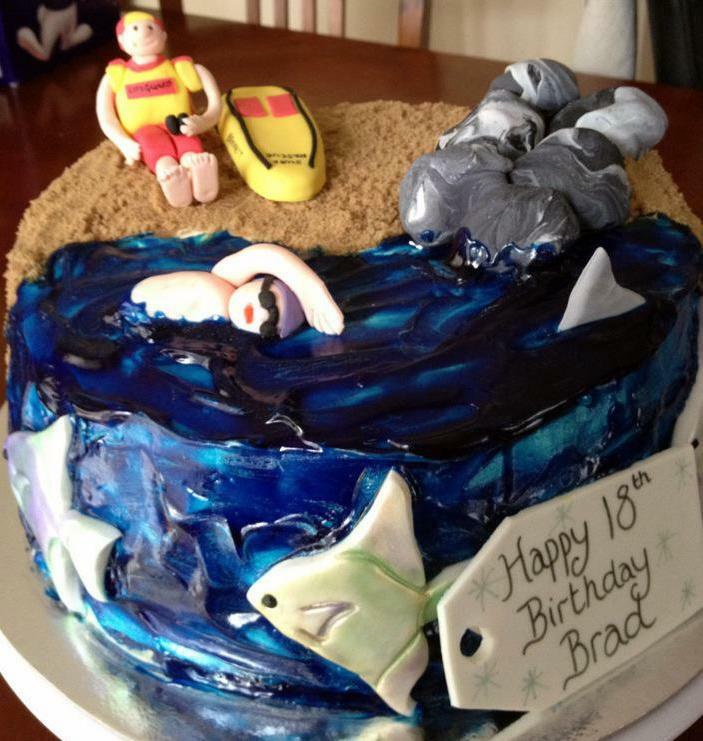 Well here it is, my Lifeguard Cake. Also, this is my first attempt at figures. The cake is marbled sponge, with layers of vanilla and chocolate buttercream. All figures and accessories are made out of fondant. Except the tag which is made out of gumpaste, because he’d like to keep it. 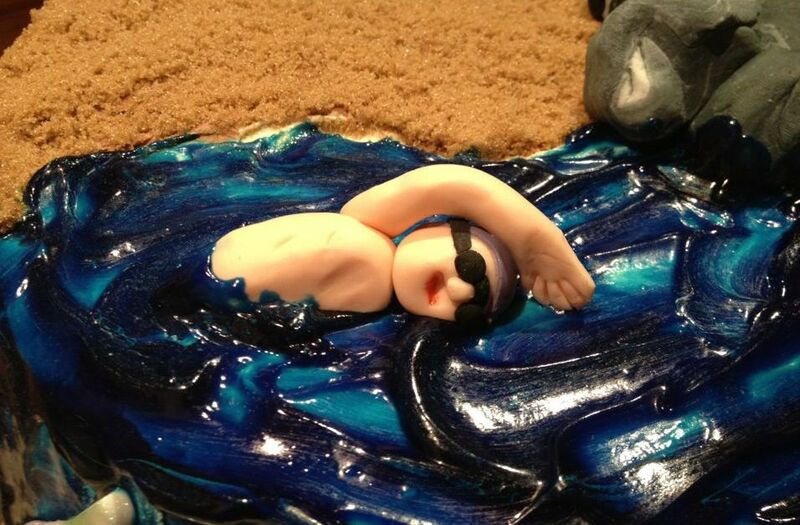 My favourite bit of the whole cake, is the swimming man. When I was making him last night, it was in the midst of a large thunderstorm. The lights kept flickering and even my fish tanks stopped running. I actually said a little prayer last night that the power wouldn’t go out. As we all know that darkness doesn’t equal good decorating. Fortunately for me the power stayed on. 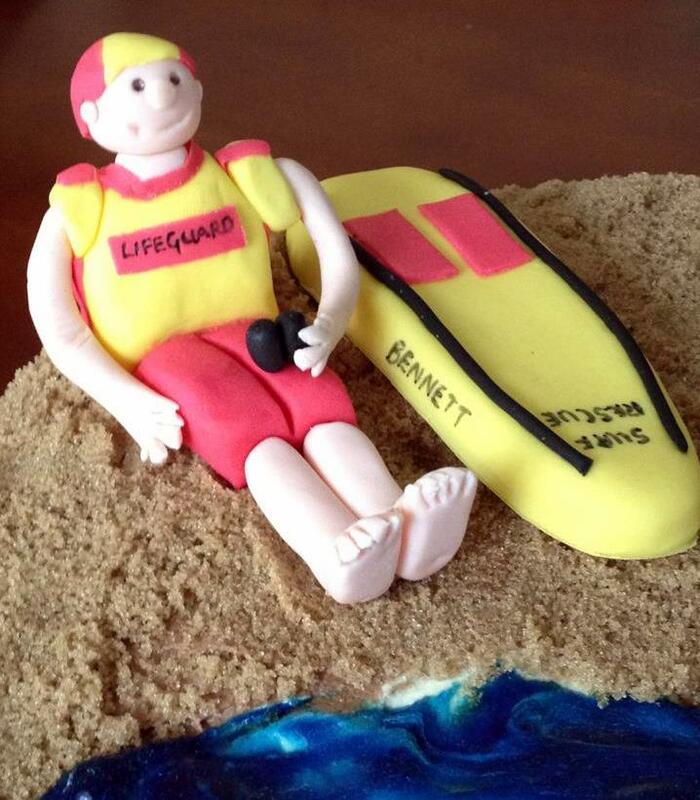 I had fun making this cake, the Australian lifeguard and his surf rescue surfboard, were fairly small, and so the writing had to be tiny. Thank goodness I had edible pen ink to do the smaller details. I had to do the writing in black, as I didn’t have a red pen. Which would have made it a little bit more authentic. As well as lots more practice on figures. My next cake is the big one, the vintage glamour wedding cake. That cake will take up most if not all of next week to complete. I also have a small cupcake order for Easter Monday. Well after the joy of baking and decorating, all that is left is the washing up, I much prefer the decorating. Well here it is, this my eldest daughters 50’s themed birthday cake. 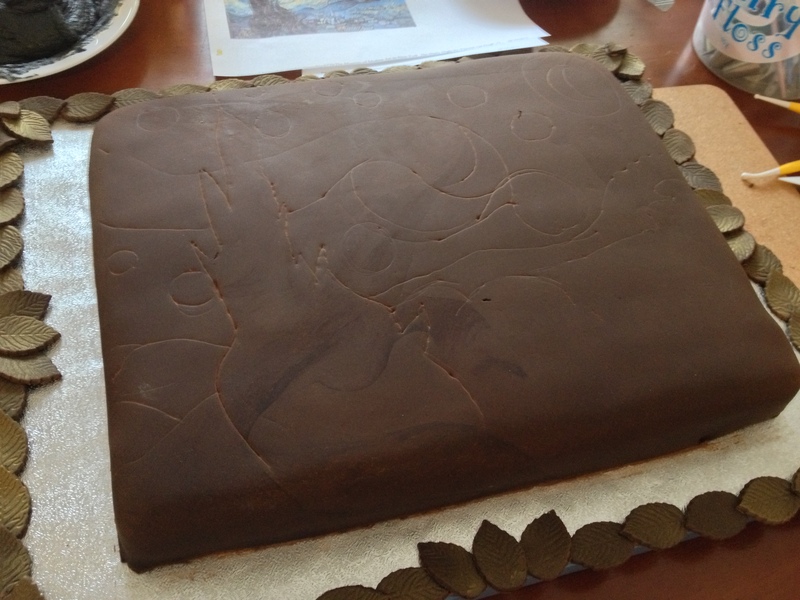 Under the gorgeous decoration (I know – I’m biased) of fondant icing, is chocolate truffle torte covered and layered with chocolate ganache buttercream. 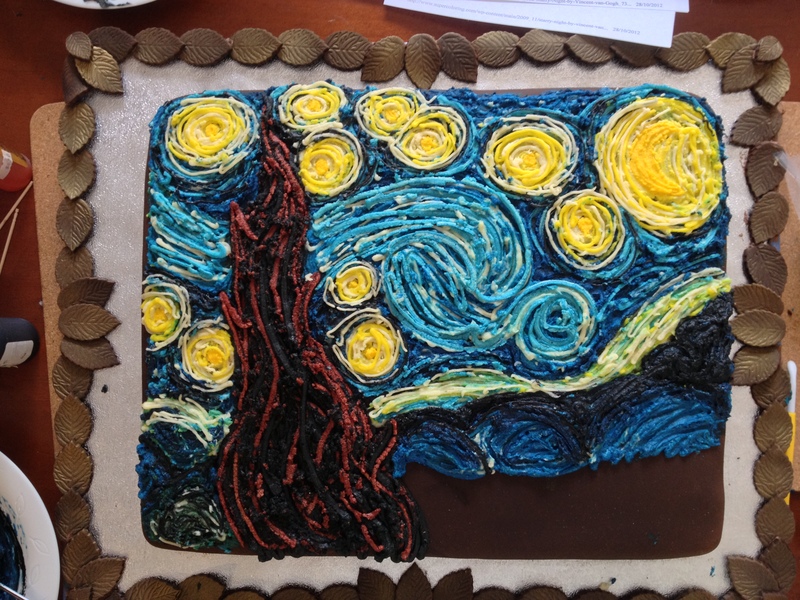 Last night when I started this cake, I honestly did not know what it would look like. After covering the middle layer with the pink fondant I took a quick break. Not sure how, but in the 2 minutes that I was away I could see a vision of the cake in my head. So from 7pm till 1am I worked to complete that vision. 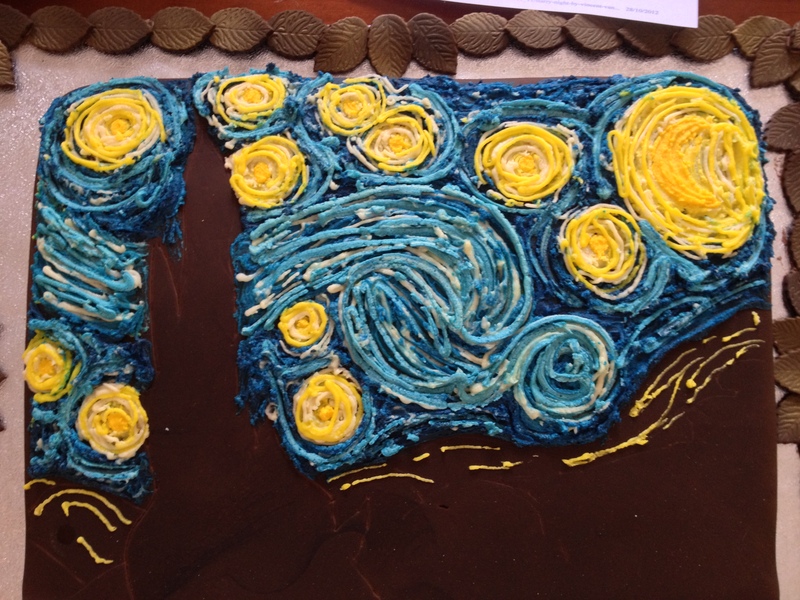 My daughter had so many ideas for the cake, that if I had done what she asked, it would have looked like a mess. So in the process of decorating I striped it back to basics. 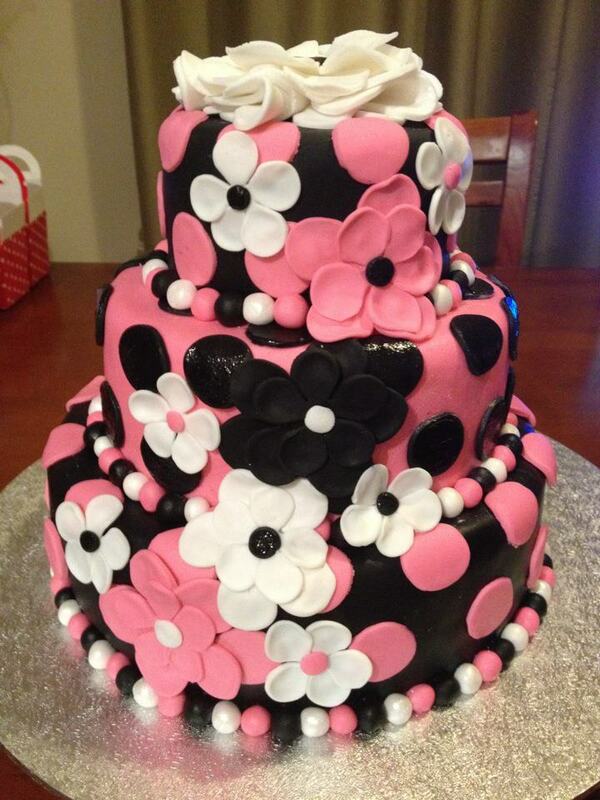 I’m glad I did polka dots because, my cake matched most of the young ladies 50’s clothing that they wore today. 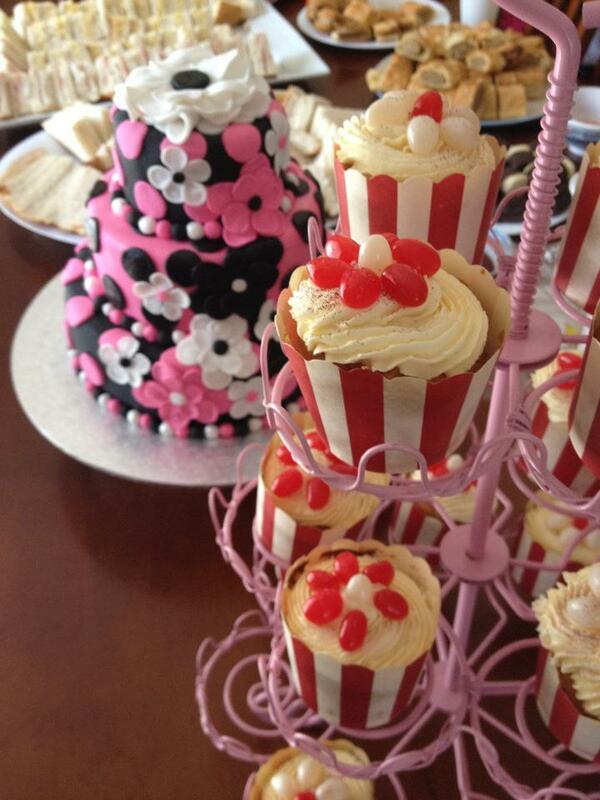 Keeping with the theme, the party bags, were red & white polka dot cupcake holders. So all the kids got red and white jelly beans, balloon, a cocktail umbrella (they went down really well! ), and they got a cupcake each. 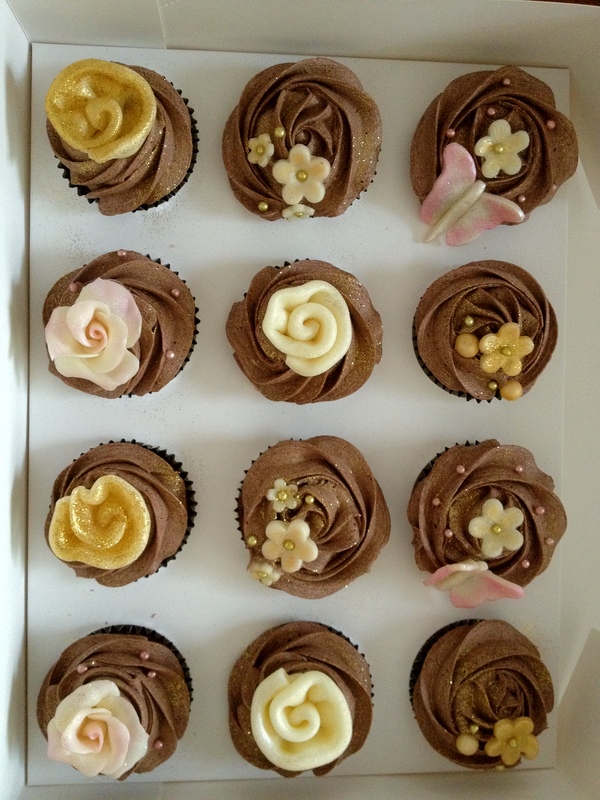 The cupcakes were kept simple – vanilla sponge, vanilla buttercream with the jelly beans made into a little flower pattern. And finished off with red & violet glitter. We kept with the 50’s theme right down to the food, sandwiches, sausage rolls, jelly and Battenberg cake. Everyone ate and drank well, the kids had fun and filled the house with laughter, and my daughter got some really nice presents, which she is now going through and playing with. As for me, I now get to chill out and relax. More importantly I am aiming for an early night, as all that party prep is tiring! Today it is my eldest daughters birthday. We had a small celebration today with the grandparents. 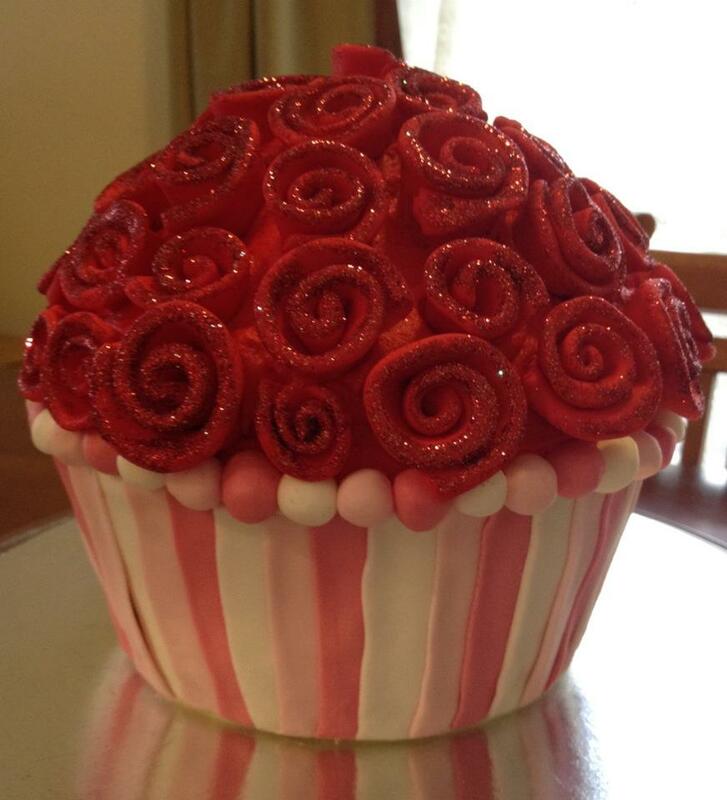 As it was only a few of us I decided to make a giant cupcake, decorated with ribbon roses – which I made the day before in preparation. I only had a couple of hours spare today, as we were moving rooms around. So I baked the cake in a silicone mould. And when it was ready I put it in the fridge to cool down quickly. I layered and covered the cake in buttercream. Following that I made thin strips of fondant in 3 different colours of pink and placed them all around the cake, and making sure they slightly overlapped each other. I then made fondant balls to split the levels. The top half was then covered in roses. For the next time I will make more roses, to make sure all the gaps are filled. However that is me being picky. My daughter and family loved the cake, and it tastes pretty good. Next week my daughter is having a 50’s theme party with her friends. And she is currently designing (with my help) a 2-3 tier cake with a rockabilly edge. Should be quite an interesting cake by the time she is finished. Before that, I have a Chanel inspired 40th Birthday cake to make on Friday. This cake will be black, white and a little quilting, keeping it simple and classy. After the cake, the birthday and the room moving I’m heading for an early night. 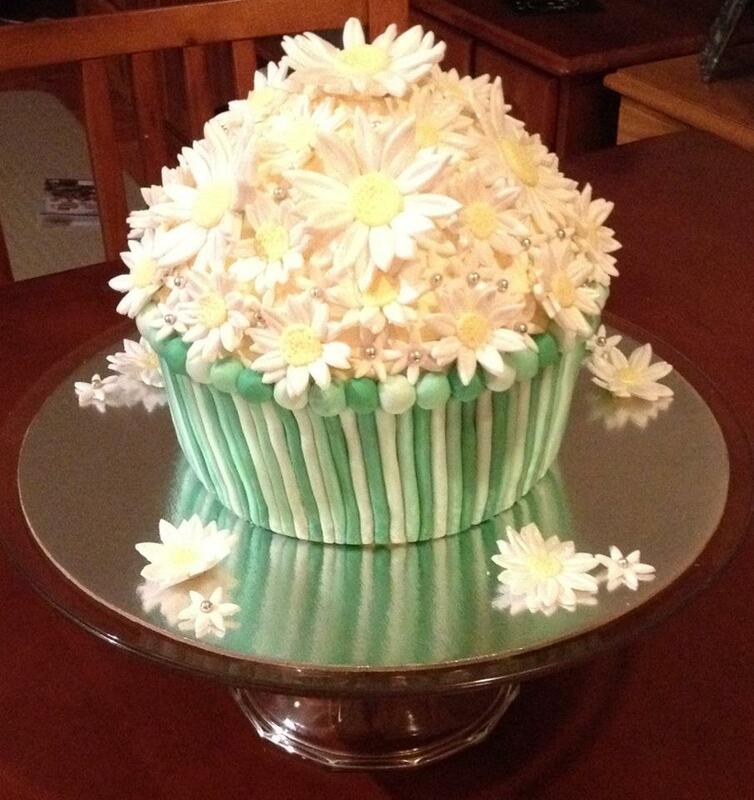 My latest creation – the Giant Daisy Cupcake. I apologize, as I am meant to be doing a blog a day. I’m a bad blogger lol. Over the past week I have been making fondant daisies and allowing them to dry in my kitchen cupboard so they maintain their shape. 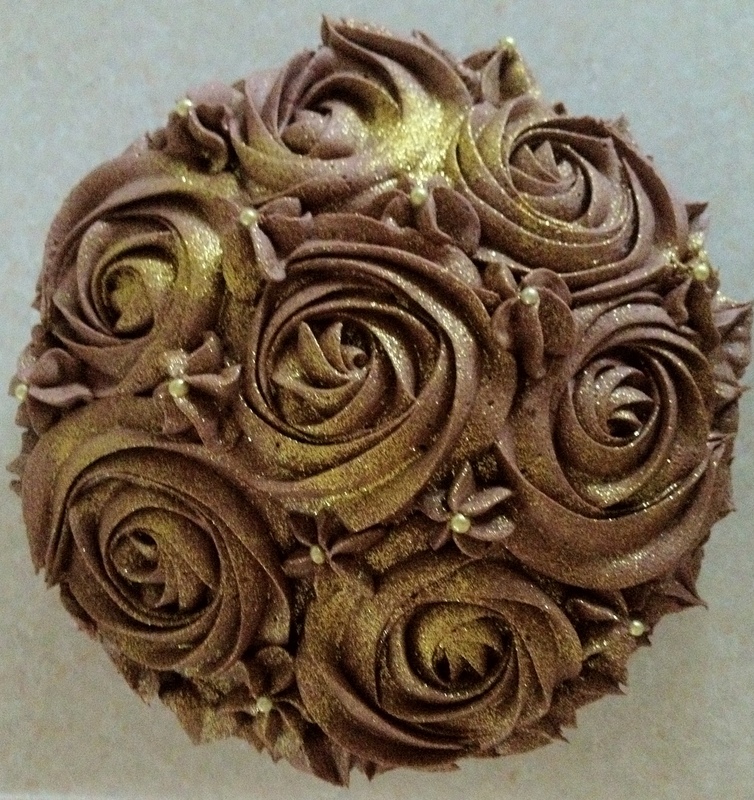 I then brushed them with lustre and violet edible glitter – as they needed a little shine. 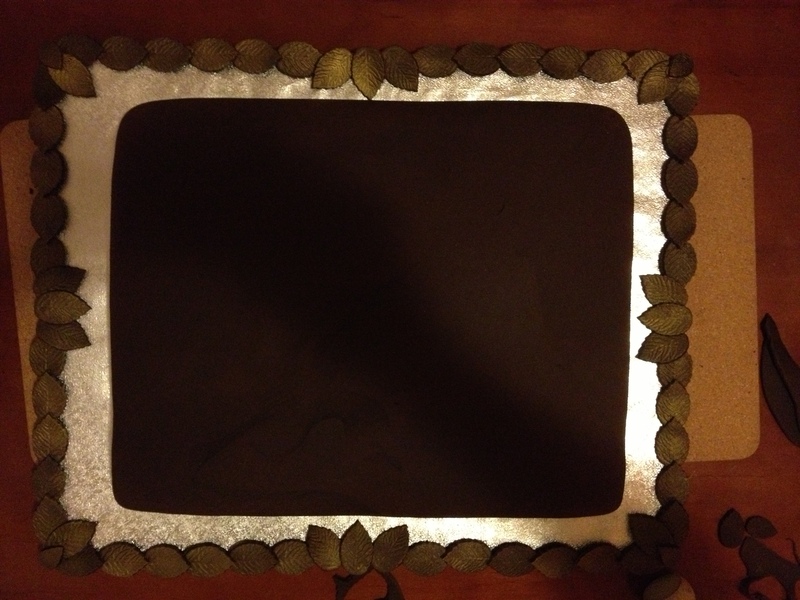 I also baked with silicone cake mould – for the first time. I still prefer my tins, but I thought I’d give it a go. 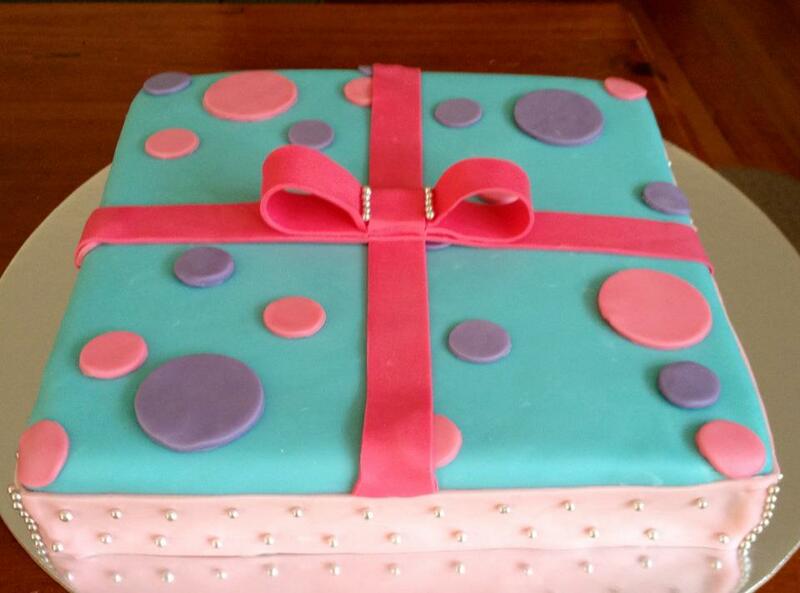 Once cooled I layered and covered the cake in vanilla buttercream. I then proceeded to roll out using a fondant smoother each individual green stripes to go around the bottom of the cake. And added a band of small balls in the same 3 shades of green to act as a border. 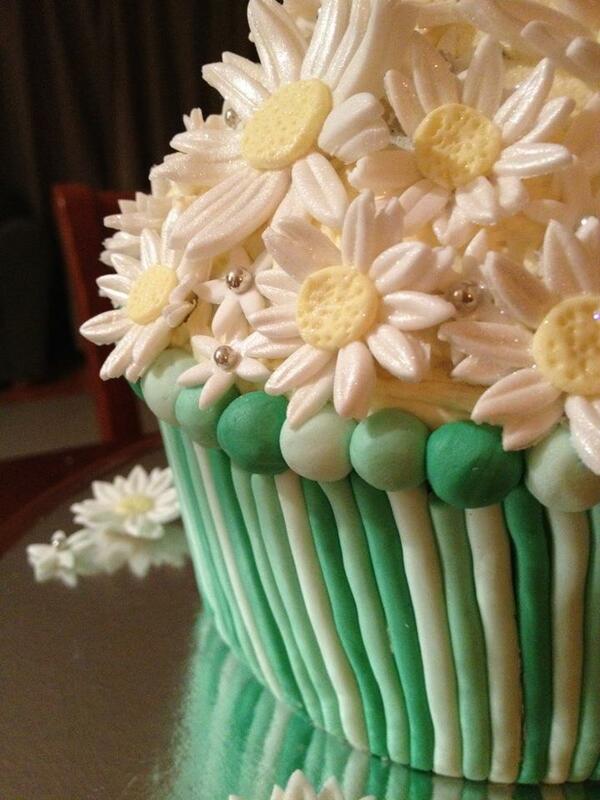 After that I just had to place the 3 different size daisies on top of the cake. 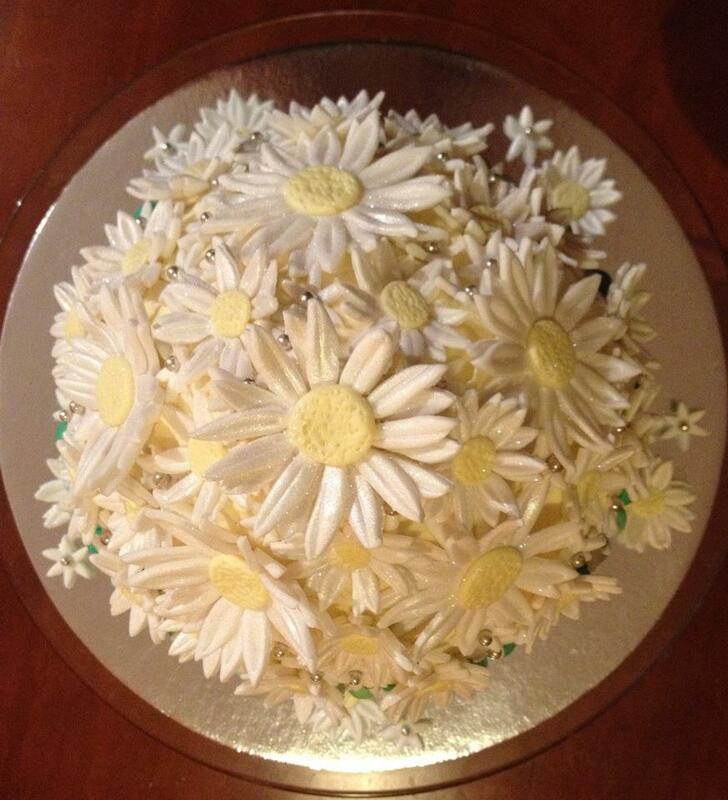 I had a few spare daisies which I placed around the cake board in a decorative pattern. I have another giant cupcake to make tomorrow. This one is for my eldest daughter. The cake will be covered in ribbon roses, and a similar styled bottom, just in a different colour. And to finish – it will have butterflies flying around it. I just hope she likes it??? I’ll be back tomorrow with more cakes.